Throughout the large part of the 200,000 years of human history, temperature-wise, human experience was limited to 100 to 1000K range. The ambient temperature of the Earth plus what we could get out of fire was about it. It has been only 150 years since we started exploring the temperatures outside that range. The technical advancement in obtaining both high and low energy allowed us to do some amazing things. As physicists, one of them is of course figuring out the origin of the universe, usually referred to as the high energy physics and cosmology. Currently, we can get to the energy scale that corresponds to 100,000,000,000,000,000K, which is estimated to be the temperature right after the Big Bang. Although, we as human beings are experiencing 100-1000K on the Earth, the average temperature of the outer space is about a few K, constantly cooling down since the Big Bang almost 14 billion years ago. In that sense, temperature captures the history of our universe, and achieving any temperature below a few K is reaching the region the nature itself has never experienced on its own yet. 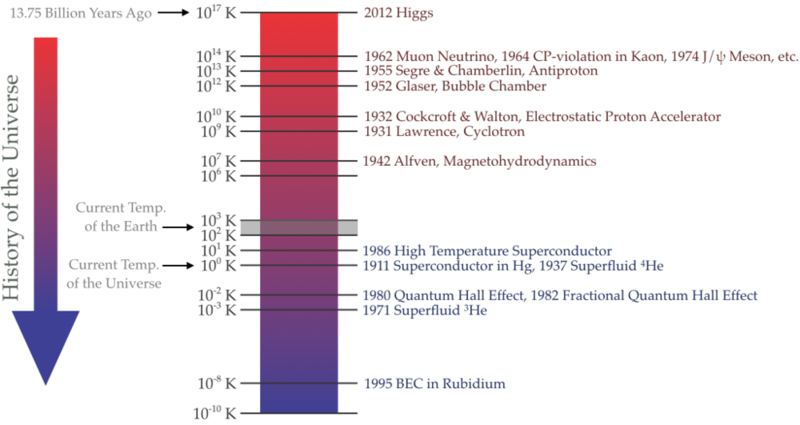 The low temperature physics is our exploration into the future of the universe. As the universe experiences the cold death, everything will likely turn into dilute dusts scattered about in the space. But by some remote chance, should anything interesting remain, they won't be living things of today but the things we are looking into right now with the tools available to the so-called low temperature physics. Superfluid 3He is the only superfluid/superconductor confirmed to be a p-wave Cooper pairing superfluid. It makes a great candidate material to study topological superfluidity, which is also expected to host Majorana fermion, a (quasi)particle whose anti-particle is the particle itself, at its boundaries or vortex cores. Due to its topological nature, when confined in two dimensions, superfluid 3He carries a spontaneous circulating current at the edge whose direction is determined by the orbital angular momentum of the px+ipy Cooper pairs. We are currently developing an experimental technique to measure this edge current directly, and are probing other interesting properties of superfluid and normal liquid 3He. A two-dimensional electron gas (2DEG) forms when electron motion is inhibited in a dimension. The GaAs/AlGaAs heterostructure interface is a prime example of such systems for its high electron mobility, large fermi-wavelength, and small spin-orbit coupling. Said features render GaAs 2DEG as one of the most reliable platforms on which 2D fermionic systems can be studied. Methods to manipulating and measuring GaAs 2DEGs are well understood, and the system has always been a staple in mesoscopic physics. The system particularly lends itself well to quantum dot research, which in turn has rejuvenated interest in the Kondo effect. We are interested in the interplay between quantum dots and other 2DEG features, such as the quantum Hall Effect, and their manifestations in the scope of Kondo physics. Exciton-polariton is a light-matter interacting quasiparticle usually found in various semiconductors. The light component of the exciton-polariton makes it easy to visualize the system both in real space and momentum space. In return, dynamics of the exciton-polariton can be studied in real time with such a visual aid. A layer of interesting complexity is added by the fact that exciton-polariton is an driven-dissipative quantum fluid whose particle number is not conserved. All of these properties makes it an excellent candidate for studying quantum fluid dynamics. We are marching down the avenue by trying to control and manipulate quantized vortices in exciton-polariton quantum fluid. Technically, these electrons are not a quantum liquid. Rather it is a very classical liquid.